Konami Kukeiha Club - Contra. Vinyl LP. Bleep. Library music in a modern sense here. If you owned a games console as a child, the Japanese videogame studio Konami were probably responsible for some of the formative experiences of your youth. That goes for musical experiences too - just check the influence that the studio’s Kukeiha Club (in English literally ‘square-wave club’) sound team has had on genres like techno, grime and chiptune. 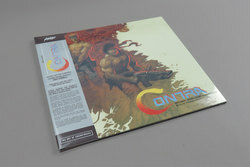 The 1987 run-and-gun Contra is one of Konami’s classic works, and it joins the studio’s Lagrange Point and Castlevania series in being pressed to vinyl. Out via MONDO, a label with a proven track record in reframing video game music as a worthy listening experience.